This release completes Ulf Wallin’s survey of the violin music of Max Reger, orchestral, piano accompanied, and solo. 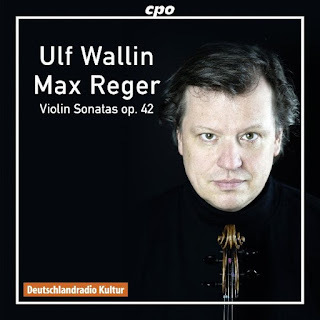 Despite strong competition, many of these recordings are the finest available, and the sonatas (with piano) in particular deserve recommendation for the vibrancy, range of tone color, and sheer interpretive imagination that Wallin projects. The Four Sonatas for Solo Violin are less popular than Reger’s other solo violin cycle, the Preludes and Fugues, op. 117, which are now a staple of the repertoire. Wallin speculates, in his liner note, that this is due to the greater technical challenges posed by the op. 42 set. That’s a plausible theory, as this is clearly virtuoso repertoire. Double-stopping is the rule rather than the exception throughout most of the set, often with rhythmically independent contrapuntal lines. When the music is fast, as it often is in the outer movements, Reger makes no concessions in terms of note density or detail in his articulation and bowing. And through all this, he also expects vibrancy, energy, and, lightness: the Allegro markings of the first movements are qualified energico, con grazia, and con brio. The influence of Bach is never far from the surface, yet the music rarely feels neo-Baroque. In the later Preludes and Fugues, Reger seems more intent of inhabiting Bach’s soundworld, whereas here the influence is mostly confined to technical features. Occasionally, as in the opening of the First Sonata, we hear a gesture that could have come straight from Bach, but then in the answering phrase, where we might expect imitation then sequences, we instead hear more elaborate, and usually longer, phrase development. The implied harmonies are adventurous too, which, combined with the almost continuous multiple-stopping, creates a soundworld firmly rooted in the late-Romantic virtuoso tradition. Wallin’s performances are, as ever, close to ideal. He brings an ideal sense of impulsive energy to the faster music, always rhythmically incisive but never weighed down by the music’s complexity or the demands of the multiple-stopping. The slow second movements all sing, and flow with a rubato that is sometimes quite extreme but that never feels indulgent. The recorded sound conveys the ambience of a resonant venue, but with the violin up-close. That can make the upper register sound abrasive at times, but hardly to a fault—this isn’t easy listening. An excellent conclusion, then, to a superlative, and to my knowledge unique, survey of Reger’s complete violin works. The works for solo violin are clearly landmarks in the history of the form, and while the Preludes and Fugues are likely to remain the more popular, for the fewer demands they make on both performer and listener, the Sonatas demonstrate a higher level of innovation and textural subtlety, all of which is compellingly conveyed here.